As a part of my extensive text analysis project in 2017, I decided to conduct an analysis of more than 500 case studies by the world’s 100 biggest software and IT companies (according to PWC, 2016). The result is “The Big Study of Case Studies 2017”, which you can request for free download here. Today, I will share with you the 7 key insights I have derived from my study. 1) Videos tend to complement, not replace case studies. With the rise of corporate video and video blogging by companies, many an expert has predicted an end to classical content marketing, especially to the seemingly “outdated” text-only files. While it is true that more and more companies like SAP and Siemens PLM are sharing many of their case studies/customer stories in video format, I have found that for most companies text case studies and video case studies go hand in hand. Or in other words, they tend to complement rather than replace each other. For example, take a look at the case study overview page by Citrix. They alternatingly use case studies in text form on separate online pages as well as videos, probably taking into account that prospects have different preferred media forms and they want to cater to both audiences. A great example of how text and video can complement each other is shown by Microsoft. They offer their case studies as a text version on their website and then include a video file in the middle where they show customer statements, offering maximum social proof and credibility to their story. Moreover, they offer short summaries for download as PDF-files. It is important that companies consider an “as well as” instead of an “either or”-paradigm when it comes to the debate between text and video. Text is also important because it is good food for search engines, video is obviously more engaging and convincing (if done well). The combination of course requires a web-version of the case study and cannot be done in a downloadable PDF-file where images may be used instead. 2) There are 2 common case study overview page designs. Because I was curious about best practices in all areas of case study creation and marketing, I also took a look at how companies preview the case studies on their website on what I chose to call “case study overview pages”. Taking note of their design and layout, I found that there are 2 page designs that clearly outweigh the others in terms of frequency of usage. The most common one is a 3-columns page design (34% of cases) where there are 3 case studies presented in one row – always a small image on the left and then a short teaser text on the right. The second frequently used page design is to simply have one column where you show a bigger image on the left side of the row and then have 4-6 lines of teaser text that complement the rest of the full width of the page. This one was used in 33% of the cases analyzed. Other variations were 4 columns (15,9%), 2 columns (10,2%) and even 5 or 9 columns were used once each. When choosing an optimal layout for your case study overview page, this benchmark can be a good guideline as users will appreciate a design they are used to. The 3 vs. 1 column-design makes quite a difference. Personally, I felt the 3-column-one was the most user-friendly overview. Naturally these previews are only in multiple columns on the desktop computer and change to single column on mobile devices. TIP: Use the 3-column-design and if you have videos and text, be sure to use both alternatingly in the first rows so both users that prefer to read or watch will know that they are catered to. To preview a video case study, be sure to use the Play-Button in the middle of the preview image, similar to a YouTube video before it’s being played. 3) Many companies use the term “success stories” or “customer success” instead. Taking a look at the details, I noticed that quite a few companies tend not to speak of “case studies” but use different terms instead. 20 of 93 companies that offered files for download used the term “success stories”. 16 of 93 commonly chose instead to speak of the “customer success” section. One of the reasons could be excluded. Namely the general difference between case studies and success stories, as presented in my blog post, did not apply. There were no general differences in length between those 2 terms being used. This finding does have to be taken with a grain of salt. Many companies use a recommendable dual- or multiple-term-approach. For example, they may use the term “success story” in the overview page and the PDF-file but use the term “case studies” in the site URL and the page title. Given the fact that prospects on Google Search may be using either one of the terms as keywords, a dual-term-approach maximizes the likelihood of being indexed, ranked well and therefore found with either term – and increases relevance in the eyes of the reader using the respective term. 4) Most case studies have a Flesch-Kincaid-Readability of grade level 10, formal or slightly formal tone. An important element of any text analysis is to determine the readability score of a text’s document. Given it is the worldwide most commonly used readability index, I used automated text analysis software service www.readable.io to determine the grade level of the texts. On average, the software determined a grade level of exactly 10. Meaning that a reader should have 10 years of formal schooling in order to be able to understand and comprehend the content and its meaning. This seems adequate and suitable, considering that most case study readers are typically decision makers or product specialists who nowadays typically have at least some academic or college degree. More surprising was that in many case studies the tone was less formal than in a normal formal document. The readable.io software found that many case studies (21,38% of all) only used a “slightly formal” tone. However, little surprise, the tone was considered to be positive. It is hard to derive specific implications from this, as readability and tone have to most importantly be tailored to your target reader and the information you need to convey. The more conservative your industry, the more formal your tone should be. 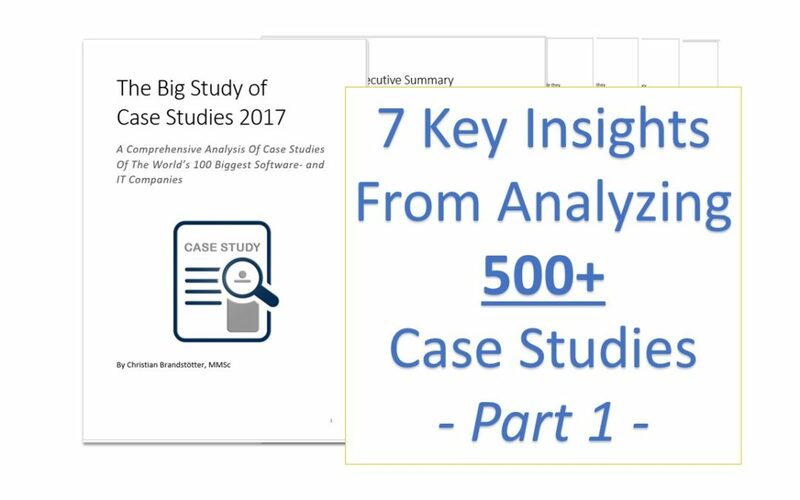 If you want to get access to the full details of my case study analysis, including more best practices and a full list of benchmarks of the “optimal case study”, request your free download here. Are you searching for professional support in this creation, optimization or marketing of your case studies? As a long-time experienced B2B copywriter and case study author, let me assist you in crafting your professional and high value case study. Contact me now to discuss next steps.